Traditional publishers hold all the cards when it comes to publishing a book. The final decision on editorial changes, book cover design, and how much promotional support (if any) a book will receive is made solely by the publisher. When authors self-publish they control every aspect of the process—from creating the book cover to formatting the manuscript to titling the book and more. Many authors who write in niche genres are overlooked and ignored by traditional publishers and literary agents because their genres can be difficult to market. For example, science fiction, fantasy, inspirational, and pulp romance are among the genres often least represented and least likely to be published traditionally. Self-publishing gives authors of these genres the opportunity to get their books out on actual—and virtual—bookshelves and into the hands of their audience. With the traditional publishing route, many people get a cut of the book’s profits before the author does, so a writer may not see a huge payout unless the book is incredibly successful. Alternatively, by self-publishing a book, the author sets the price and determines the royalty. Amazon, for instance, offers several options for royalty percentage. Instead of hoping a traditional publisher will deem their books worthy enough for promotional support, authors who self-publish have the freedom to control their own distribution and marketing strategies. For grassroots authors looking to build sales in local communities, or niche genre authors trying to focus on a particular demographic, self-publishing lets them determine their own agenda for marketing and distribution. By self-publishing their books, authors can set their own schedules and prepare their books for publication at their own pace. Traditional publishing often takes months, and the deadlines and schedules are usually set by the agents and editors involved, not the author. Self-publishing allows you to work at a pace that’s convenient for you and ensures that you are creating the best possible book for your audience. The benefits of self-publishing are obvious to authors looking for an alternate route to publication. 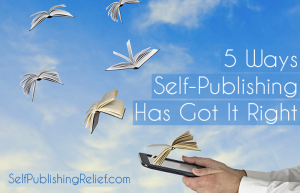 But it’s important to know that navigating the self-publishing process is not easy. If you choose to go this route, be sure you’re well prepared. Self-publishing gives you a lot of freedom, but it is also incredibly demanding work. Make sure you’re well versed in the 10 Things You Must Do Before You Self-Publish. And remember, Self-Publishing Relief is here to help you through every step of self-publishing your book. QUESTION: What are some other advantages to self-publishing? The first point here is arguably the best. Authors are a rare breed, and many of them are quite particular about their projects. Creative control is very important to a lot of writers, and self-publishing ensures that their work will be released exactly as they say. My reason was mainly #4. I KNEW I had a wide-ope market that could feed well into a niche publisher, but the publisher passed on the grounds that they didn’t do “beginner books” (since then, I’ve seen a book or three published by than that seems LOWER than the level I was writing at). That, and I new the trim-size would be significant (and non-standard). It’ll be frustrating, though, when/if I get my SF novel done. I’m not digital-darkroom-wizard enough to photomagic the cover art, nor do I have the funds to hire someone who is (unless my little non-fiction books start selling a LOT better than they are).